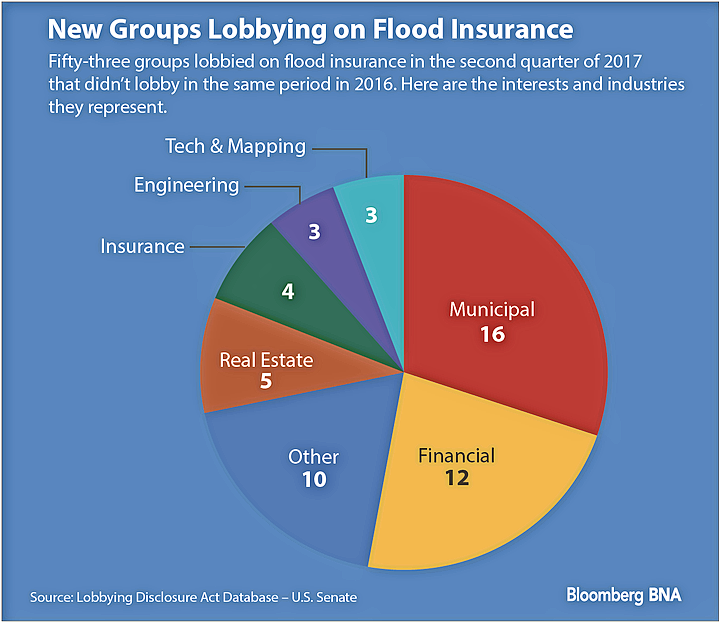 The number of groups lobbying on flood insurance jumped 51 percent in the second quarter of 2017 from the same time last year, as Congress ramped up work on renewing a federal program key to the lenders, insurers and other businesses operating in flood-prone communities. Big banks like Bank of America Corp., U.S. Bancorp, and Wells Fargo & Co. courted policymakers on the subject in this year’s April-June period. They were among 53 companies or other groups absent from flood-insurance lobbying records for the second quarter last year. While other groups lobbied last year and dropped off the new list, there was a net gain of 38 groups, a year-over-year jump from 74 to 112, according to a Bloomberg BNA analysis of records from the Lobbying Disclosure Act database, maintained by the Senate. Congress hasn’t yet reauthorized the National Flood Insurance Program, and heavy lobbying has continued as the Sept. 30 program expiration looms, the records indicate. The NFIP supplies almost all of the flood insurance in the country. A lapse in the program’s authorization would mean that the Federal Emergency Management Agency, which runs the program, can’t issue new or renew existing coverage policies. If that happens—as it has in the past—lenders won’t typically lend money, crippling related industries such as construction and real estate sales. The Bloomberg BNA analysis found that about 23 percent of new lobbying filers were banks and other non-insurance financial interests. Other new lobbying groups consisted of real estate interests, engineering firms, environmental groups, and municipalities. The Mortgage Bankers Association is among the new filers. “MBA’s main concerns are the timely reauthorization of the program to minimize business disruption, expanded private market insurance alternatives that comply with NFIP program requirements, and an exemption for commercial properties from the NFIP mandatory purchase requirements,” Bill Killmer, senior vice president of legislative and political affairs of the Mortgage Bankers Association, told Bloomberg BNA in an email. More than 10 million homes are in areas that require flood insurance, according to an analysis document from the National Association of Realtors on the most recent program lapse. Congress let the program lapse multiple times over a two-year period before passing a five-year reauthorization in 2012; sales of about 1,300 homes were canceled or delayed each day the program was lapsed, the Realtors estimated. The largest influx of new lobbying groups on flood insurance were municipal interests. They constituted about 30 percent of the 53 new groups that filed in the second quarter of 2017. Municipalities have complained that mistakes in FEMA’s flood maps can result in unnecessary costs for the localities as they attempt to dispute the maps with FEMA. The agency’s flood maps are used to determine both flood insurance rates and whether properties are required to maintain flood coverage or instead have the option to buy it. Proposals from lawmakers to reauthorize the program in 2017 have included requirements that FEMA work even closer with localities on updating its flood maps. In an attempt to minimize taxpayers’ risk exposure from the NFIP, lawmakers are trying to overhaul the program with proposals to open the flood insurance market up to the private sector, change the parameters on what properties can continue to qualify for federal flood coverage, encourage structural improvements to properties, and more. Groups that continued lobbying efforts from the second quarter of 2016 include insurers like The Allstate Corp., Chubb Ltd., and American International Group Inc. (AIG), as well as insurers’ many trade groups. Some banks were already lobbying on the issue in the second quarter of 2016 as well, like JPMorgan Chase & Co., as were banking trade groups like the American Bankers Association. FEMA owes about $25 billion to the Treasury for the NFIP. The agency has no way to repay the funds under its existing structure, Roy Wright, FEMA deputy associate administrator for insurance and mitigation that heads the NFIP, told lawmakers this year.